Among the most influential of the big-money quiz shows, and the undisputed king of the genre of the 1950s, contestants answer questions in a specific field in an attempt to win $64,000. Summer was traditionally a time when TV networks tried out new shows, not expecting much in the ratings. However, despite expectations The $64,000 Question was an instant hit in June, 1955. Back when a dollar was worth much more than today, the amount of ultimate prize money was simply staggering. Most radio game shows, from which Question evolved, offered only paltry amounts in comparison. Contestants on Question selected a category from a board and started with an easy $64.00 question. Then with each correct answer, the prize money doubled all the way to $64,000. Needless to say, the questions got steadily harder as the contestant progressed. At the $4,000 level, I believe, contestants entered an isolation booth where only the questioner could be heard. Of course, this added greatly to the drama, especially when a contestant began to sweat. At first, contestants were strictly ordinary people with expertise in a particular field. Joyce Brothers, who went on to a lengthy media career, was probably the best known of this field. After all, who would expect such a diminutive, feminine-looking woman, to know so much about boxing, of all things. Later, however, when the novelty began to wane, producers brought in celebrity contestants, such as Vincent Price to test his knowledge of art, a personal passion of his. The show continued its ratings blitz for a few more years, even having the distinction of being the only show to knock I Love Lucy out of the #1 ratings spot. However, Question was eventually caught up in the quiz show scandal surrounding its chief competitor "21" and its now notorious contestant Charles Van Doren. Congressional investigators later found out he, along with other contestants, had been fed answers and even coached in how to intensify the personal drama. To my knowledge, Question was never found guilty of feeding answers, but producers did manipulate questions to favor contestants with more audience appeal over those with less. After all, advertising rates depended on audience size, and Revlon Cosmetics, Question's sponsor, was no less interested than other commercial outfits. 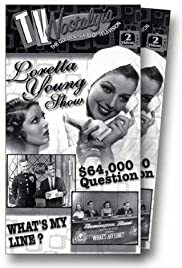 The notorious scandal that erupted in 1959 disillusioned many trusting folks, and had an understandably dampening effect on big money quiz programs for years, if not decades, afterwards. Nonetheless, back when 64-thousand was worth much more than today, many of us who hung on each installment remember the show as a compelling oddity and a memorable milestone in TV's evolution.